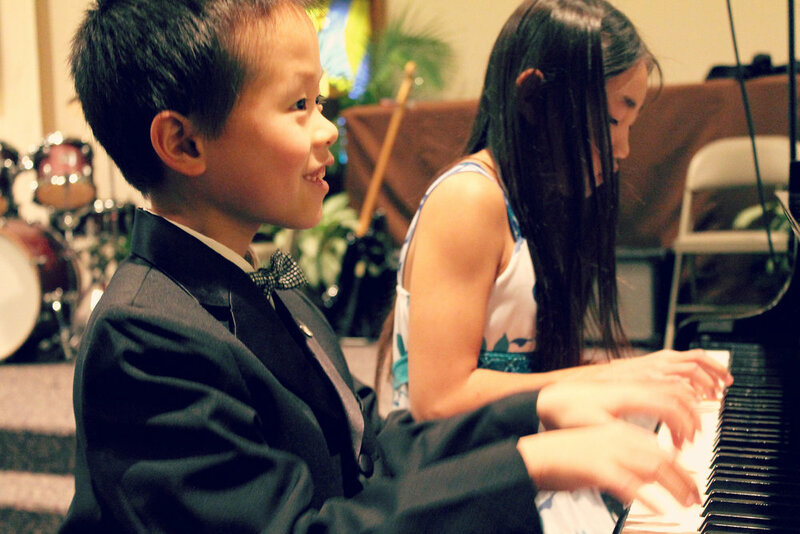 We offer private music lessons of unparalleled quality in five convenient locations across the Metro Detroit area in piano, voice, guitar, ukulele, drums, violin, cello, clarinet, flute, saxophone, trumpet, tuba, and more to all members of the family and amazing early childhood classes for ages 3-5. Our heart for helping others to succeed is what drives us to create, continually improve, and systematically implement an innovative and enriching music program. From the moment new students walk in the door, they immediately know we are different: from our gorgeous and comfortable lobby and lesson rooms, to the welcoming smile and hello from the front desk staff, to the remarkably talented team of professional instructors who infuse energy and character into the learning experience, making it come to life from day one and onward. Expressions is a magical place where the energy and motivation to grow and achieve is simply contagious. Your family can save time and money taking lessons in multiple instruments on the same day! We welcome all beginners and all higher levels of experience - no matter your age (adults included). We offer music lessons in piano, voice, guitar, bass guitar, ukulele, drums, violin, viola, cello, clarinet, saxophone, flute, oboe, trumpet, tuba, and trombone. We offer a unique early childhood music program for ages 3-5 called Level Up Junior which is different from all the rest. Our youngest students prepare for private lessons through a structured, progressive, 10-level curriculum involving games, worksheets, instruments, singing, and small group class instruction. Our students have been enthusiastically climbing from levels 1 through 10, earning certificates, wristbands, stickers, and trophies since we launched this signature program in 2012. Think about the martial arts Black Belt program… but for music lessons! This structured, nationally recognized, and motivating program is completely free (and optional) for Expressions students of all ages, and our students have never been more motivated to master their instrument! Many music studio desks are staffed by the teacher or owner or more commonly, an answering machine. We have a team of super caring administrative professionals who are available at the front desk to assist our students warmly and effectively in person, by phone, by email, or by text seven days a week. We think you will quickly find we are one of the most organized companies you have ever worked with! We have many weekday afternoon and evenings and Saturday and Sunday morning and afternoon lesson times, and we're open all year round, including the summer. If you need to cancel your lesson or change your lesson time, no problem! Our busy families love our convenient unlimited makeup lesson and schedule change policy. We are so incredibly proud of our beautiful, clean, bright, and spacious facilities! Most studios hold their lessons in small and almost closet-sized rooms, but we think it is important to learn in an open, airy, inspiring environment with natural light and tasteful décor! We believe learning music should be seriously fun, and we like for our facility to represent both the serious and fun natures of what we do and who we are! We have spacious and comfortable waiting areas for our families with free WIFI, magazines, water, and complimentary hot coffee and tea. For the younger students or siblings, we have our Music Lab with fully-loaded music education iPads, a music coloring station, music books, music games, and more. Our students and their families LOVE hanging out in the Music Lab! For students who enjoy a little extra push, there are competition opportunities available for Expressions students through the American Guild of Music. AGM competitions cater to students of all ages, levels, and instruments, and our students who participate always feel excited and motivated to practice and compete again the next year. Competitions are always optional and we never require our students to perform or compete. Due to our central locations in Novi, Troy, Plymouth-Canton, West Bloomfield, and Rochester Hills, our school is convenient and draws students from all over the Metro Detroit area including Northville, Ann Arbor, Wixom, Brighton, Milford, South Lyon, Walled Lake, Farmington, Farmington Hills, Southfield, Royal Oak, Birmingham, Bloomfield Hills, Clawson, Rochester, Sterling Heights, Ferndale, Livonia, Westland, and other neighboring communities.